Grain free cat food is available from a number of different companies. Below are some of the brands that offer grain-free options, and why you might want them. If you're looking to up your cat's game in the dinner department, one of these might be to your kitty's liking. Many pet food companies include grains in their formulas. This is often especially true of dry cat foods, but they're also used in canned foods as well. The proponents of grain free cat food argue that the ancestors of modern house cats did not dine on cereal grains. "The ancestral diet meets modern nutrition." Backing this up, of course, is the known classification of cats as obligate carnivores. There are also some health concerns with respect to high grain/high carbohydrate diets and some common cat illness symptoms, such as vomiting, gas, bloating, and diarrhea. some cat owners have reported that inflammatory bowel disease symptoms have subsided when switching their cats to diets with no grains. In fact, many feline health experts are pointing to improper diet as the cause of a number of diseases. In other words, pet food is making our cats sick. Cats in the wild evolved to hunt live prey, and don't eat a lot of grains, if any. As obligate carnivores, cats need to get certain nutrients from animal sources. These are nutrients (such as Vitamin A) that their bodies cannot make, and that they cannot easily get from plant sources. Carrots are fine for rabbits, but a cat can't make vitamin A from beta-carotene. Taurine is another important nutrient that cats need which meat provides. Taurine is an amino acid that cats cannot synthesize from other nutrients. Amino acids are considered the "building blocks" of protein. Taurine deficiency leads to health problems in cats, including blindness, so most cat foods will add taurine supplements. Cats also have very different metabolic systems from humans. Cats don't process carbohydrates well (there aren't a lot of carbs in a cat's natural prey - rodents and birds). High carbohydrate diets are therefore unnatural, and have been linked to such illnesses as feline diabetes (monitor your cat for feline diabetes symptoms) and obesity. As this article on obesity in cats indicates, obesity in cats has become epidemic. In part, this is probably due to "fat cats" lounging around and not getting enough exercise, but largely, it's diet related. Deborah Greco, DVM, Ph.D., a veterinary internist at The Animal Medical Center in New York, says that a cat's natural diet is low carbohydrate (again, think mouse). "Cats should have a diet that is high protein, high fat and low carbohydrate," Greco says. So, the idea here is that a primarily meat-based, grain free cat food provides more natural nutrition for your cat. There are also reports of high carbohydrate/high grain cat food causing a number of other cat health problems. These problems include possible feline allergies to certain grains, digestive problems, and as mentioned, feline obesity. In addition, many of the pet food recalls in the last few years related to contamination of grains or ingredients made from grains (such as gluten), not meats. Below are some companies that offer various brands of grain free cat food lines (or low or nearly no grain). Holistic Blend Organic Cat & Dog Food is grain free. EVO by Natura Pet Products makes a dry and canned grain free food. Orijen from Champion Pet Foods is a high protein, grain free dry cat food. Instinct Grain-Free Nutrition is available in canned and dry kibble versions. The company also makes Instinct Raw Frozen Diets for Cats which are raw food diets for cats available in both frozen and freeze-dried varieties. Newman's Own Organics offers a 95 percent organic food for cats that is grain free. Solid Gold offers Indigo Moon Holistic Cat Food, which is a dry food with no grains. It's also gluten free. 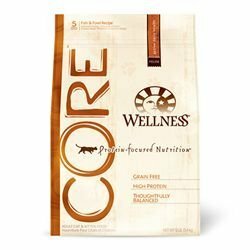 The Wellness CORE line includes a dry food formula with over 80% meat ingredients.